The term ‘digital oilfield’ is used to describe the vision of real-time asset management for optimal oil & gas production and field management. Many oil & gas operating companies, large & small, have taken the initial steps to instrument and automate wellsites for remote monitoring & control. This has enabled them to analyze and visualize field production data to make decisions that optimize well and fieldwide performance. While these steps are necessary, they are not enough to completely realize the vision of a truly digital oilfield. The remaining steps include incorporating the ability to respond to events in real-time that require human intervention. Such examples may include responding to an unexpected drop in production, a spill risk, an erratic tubing or casing pressure measurement reading, hydrate buildup, or a poorly functioning regulator. 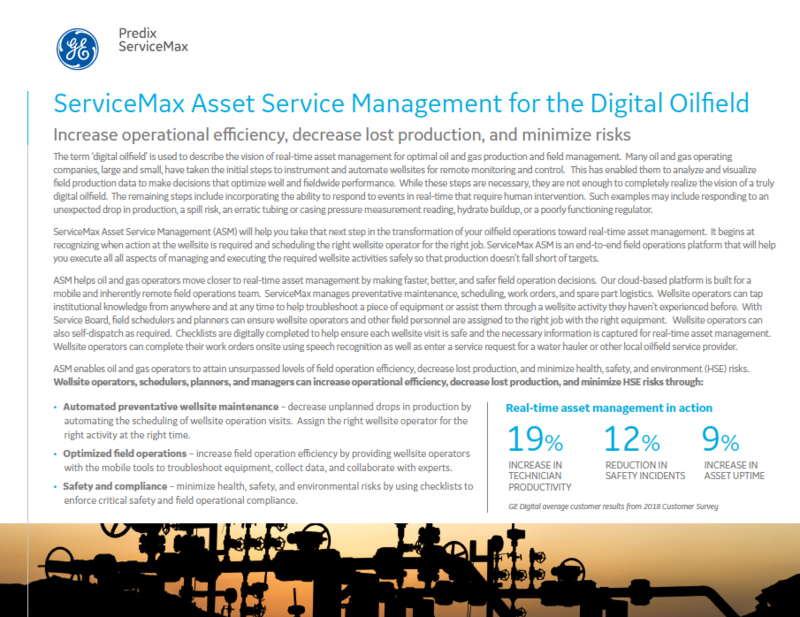 ServiceMax will help you take that next step in the transformation of your oilfield operations toward real-time asset management. It begins at recognizing when action at the wellsite is required and scheduling the right Wellsite Operator for the right job. Our end-to-end field operations platform can then help you execute all other aspects of managing and executing the required wellsite activities safely so that production doesn’t fall short of targets.